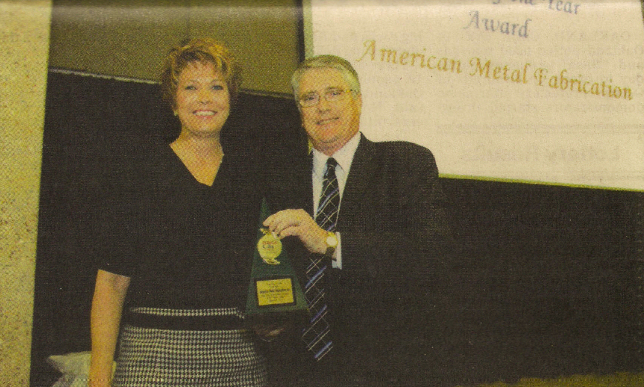 American Metal Fabrication was named 2011 Industry of the Year during the 2011 Ponca City Chamber of Commerce banquet held Thursday night. Kelly Knecht, sister of owner Jack Houseman, and an employee of the firm, accepted the award. She said "On behalf of Jack and his wife Kelly, I want to thank you for this award." Knecht had been at an International Show and Jack and Kelly had flown there so she could come back to Ponca City and accept the award. On behalf of her brother she thanked the American Metal Fabrication employees and their spouses or significant others, while employees had work long or unusual hours. Expressing appreciation for the Chamber of Commerce, Knecht told the audience, "You have no idea how lucky you are to have a Chamber so strong it is so supportive of local businesses." Knecht also thanked "community partners" Eastman National Bank, Ponca City Development Authority, Pioneer Technology Center, and local suppliers. David Myers, Ponca City Development Authority, presented the award. 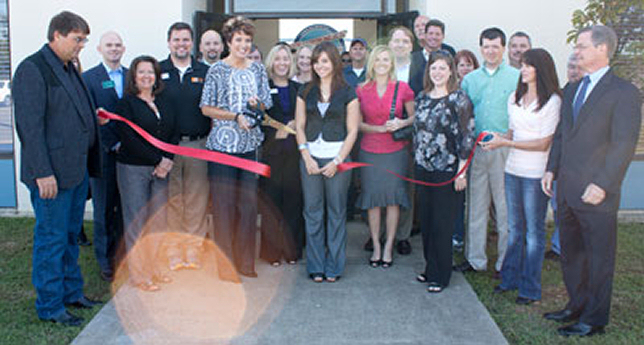 "The Ponca City 2011 Industry of the year personifies successful, modern global industries. Its resilience in the face of change, and its ability. to grow during time when others could not, marked the company as not just a good company, but a great one." Myers continued, "The company has been in, business since 1994. Originally, as with' so many other industries, they planned to serve a particular industry. As new opportunities emerged and things changed so did their business. Their story, however, is not one of changing to survive. They did not simply transfer into another industry and become just another vendor. They found the chance to provide products for the food industry. Everyone was extremely excited this past October when the ribbon was cut at Dorada Foods and their line of McDonald's products began to come off the line." This very welcome addition joined a thriving food processing industry in Ponca City that includes Head Country and their line of products, Cookshack cookers and their, products and others. From the beginning the industry has grown into a nationally recognized vendor for the food industry -- manufacturing the equipment leading companies need. Their growth over the last decade has been so strong that they need to add another location in Georgia to serve their customers, employing 15 in the southeast to supplement the 28 employees in Ponca City. That growth and more specifically the growth of the Ponca City operation,did not stop as the "Great Recession" took hold. The company continued to expand its customer base, and its Ponca City facilities, expanding the facility on the North Highway 77 frontage road twice over the past two years. Thermal Seal Duct Systems hosted a ribbon cutting ceremony Tuesday at its manufacturing facility at 27 Superior Drive. Oklahoma-based Thermal Seal Duct Systems purchased the former Wada Metals building in the Floyd County Industrial Park south of Rome earlier this year. The company fabricates duct systems for commercial food plants. The Rome facility handles everything from the Mississippi River east to the Atlantic coast, while the headquarters plant in Ponca City, Okla., handles work west of the Mississippi.